We’re pleased to announce a major update to our iOS app, Light Blue for iOS 3.0, which brings huge improvements to Light Blue for iPhone and iPad users. Version 3 of our mobile app has been rewritten to be faster, easier to use, and bring across some of the most popular features from the Mac OS X and Windows versions of Light Blue. The feedback from our beta testers has been excellent, and we’re very happy to be able to give all of our customers access to the new app today. As well as a comprehensive redesign, one of the major improvements in the new app is that it syncs your data without interrupting your ability to use the app. This means that, if you need to look something up quickly, you can just dip into the app and do so without having to wait for it to finish syncing your latest changes. It also means that, as soon as you make any changes, they’re synced straight back up to your Light Blue account without you having to remember to manually trigger a sync. Of course, syncing the app with your account requires an internet connection, but connectivity can be hard to come by when you’re out on a shoot or at a meeting. The beauty of Light Blue being an app rather than a service that you use via a website is that all of your data is stored on your iPhone or iPad, and that you can carry on using it even when you don’t have an internet connection or find yourself with poor data coverage. Any changes that you make while you’re offline are saved locally, and when you get back into mobile or wifi coverage then you can just launch the app again to sync any changes you made while you were offline up to your account. Our new mobile app includes many new and improved features, but here’s a quick overview of some of the most important additions. Adding a calendar view was one of the most popular feature requests for our mobile app, and this update includes a really helpful one. 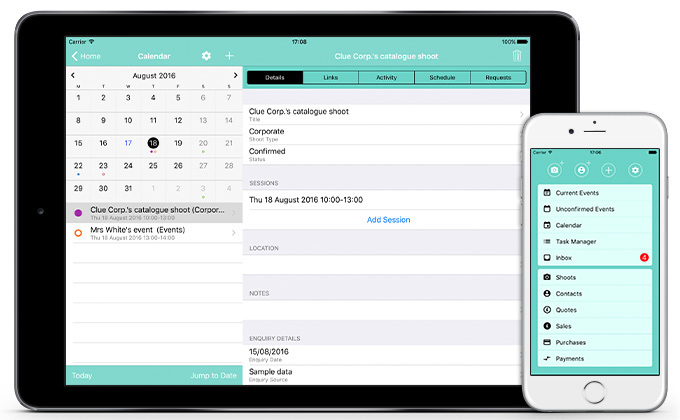 The calendar gives you a great overview of your bookings and enquiries, and brings over all of the colour-coding of events that you set up in the desktop version of Light Blue so you can quickly see what kind of bookings you’ve got on any given day. You can also add events directly to the calendar, which makes it easy to search through your diary for an available date and book new enquiries in when you’re out of the office. 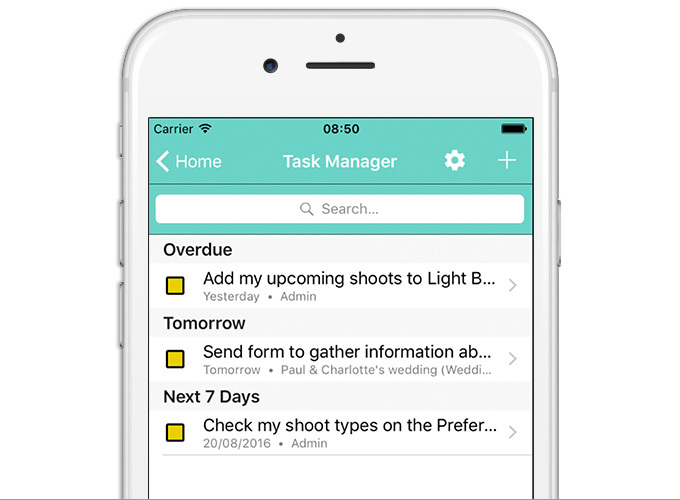 Light Blue’s task manager is now available in our mobile app, allowing you to keep on top of your to-do list when you’re out and about. You can also schedule in new tasks (including using workflows to quickly add a whole series of tasks to a shoot), so if inspiration strikes when you’re out and about then you can quickly set up reminders from within the app. One of Light Blue’s most popular features is our online contract & booking form system, and our new mobile app lets you publish contracts and forms from your iPhone or iPad. You can have these contracts & forms emailed to your client, just like you do from the desktop app, or you can open them up right there on your device. So, if you’re at a meeting with a client and they decide to book you, you can add one of your contract templates to that client’s shoot, open up the published contract on your iPad, and hand it over to your client so that they can sign it right there and then. Our beta testers tell us that doing this with the Apple Pencil and an iPad Pro is particularly impressive in client meetings. Because our online contracts and forms are hosted on our servers, you’ll need an internet connection to be able to use these features in our mobile app. Our new app can also make use of Light Blue’s online invoice payment service, so you can create invoices in the app and send them to your client for payment online. 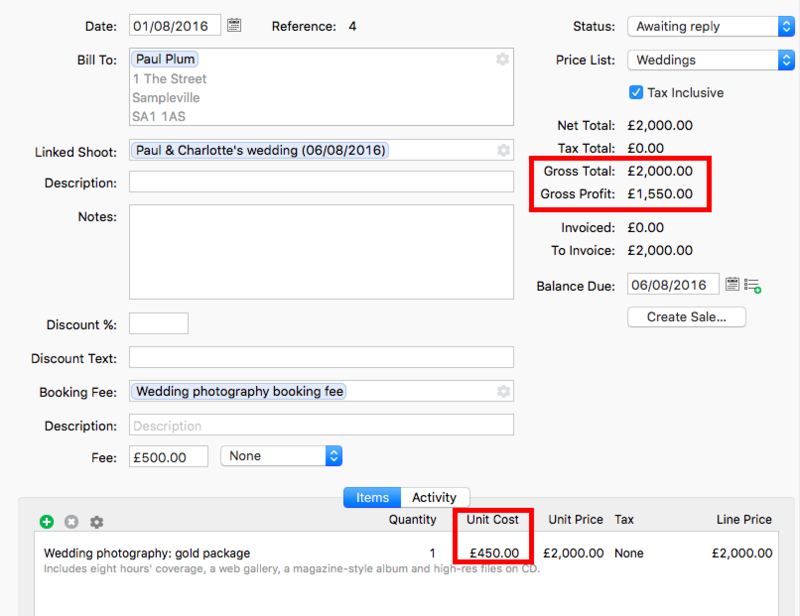 This great feature allows you invoice a client for a job as soon as you’ve finished it, maybe even before you’ve left the location. 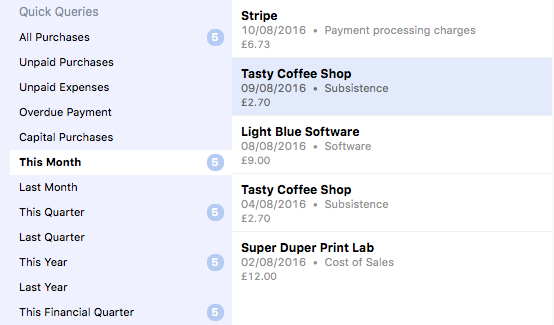 You’ve got access to all of the price lists that you’ve set up in the desktop app, so it’s quick and easy to build an invoice without having to go back into the office. Light Blue’s Inbox is used to turn messages you’ve received from your contact form into a new enquiry, accept signed contracts, and process payments that have been made online. All of these features have been brought over to our new mobile app, which allows you to handle even more of your admin quickly and easily while you’re on the road. For example, if you’ve got your contact form set up to send new messages to your Light Blue account, you can use the Inbox on your iPhone to create a new Shoot record when a new enquiry comes in. 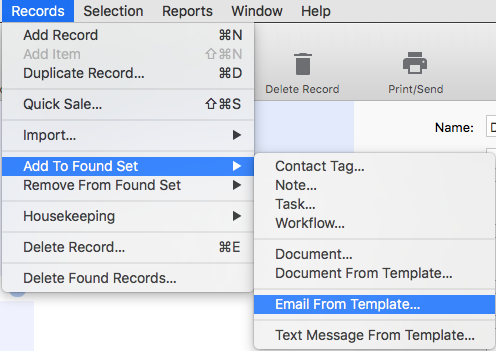 You can then use one of the email templates that you’ve set up in the desktop version of Light Blue to quickly respond to your prospective client by creating a new email in Apple’s Mail app. 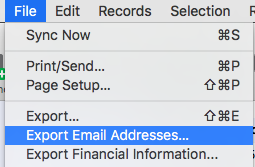 One feature that we haven’t been able to bring across from the desktop app’s Inbox is importing emails, because iOS apps are tightly controlled and isolated from each other and therefore we can’t import emails from the Mail app. However, we’re working on plans that might eventually allow us to add this feature in a future update. We’ll also be going into more detail in our webinars. You can find a list of our forthcoming webinars, plus recordings of previous ones, in the Help section of our website. Our new iOS app is available to all of our subscribers via the App Store. You can either use this link to go straight to the app, or search for it by its full name: “Light Blue – business management software for photographers”. If you already have the old app installed, you can upgrade to the new version via the App Store (or if you’ve turned on automatic updates, it might already have been upgraded for you!). The app is a free download from the App Store, but requires a subscription to our online services. Each iPhone and iPad you connect to your Light Blue account counts towards the number of devices on your account. For example, if you want to use Light Blue on a desktop computer, a laptop, an iPhone, and an iPad, that’s a total of four devices so you’ll need to be on our plan that allows you to use up to five devices on your account. You can upgrade your subscription to add more devices by logging into your account on our website and using the “change your number of devices” link. Although most of our customers seem to prefer using iPhones and iPads, we’re very keen to make Light Blue available on as many mobile devices as possible. Previously, it’s been very hard for a small team like ours to produce apps for Android as well as iOS. However, one of the main reasons why we’ve undertaken this huge project to rewrite our iOS app is because we wanted to lay the groundwork for making Light Blue available on Android. You can read more about our plans for Android in this blog post. Although most of our customers seem to prefer using iPhones and iPads, we’re very keen to make Light Blue available on as many mobile devices as possible. Currently, it’s only available on iOS, but we are planning to bring Light Blue to Android. Our original iOS app was written by a team of external developers and, although it had some useful features, both us and our customers had a long list of frustrations with it. One of our key frustrations was that the app was written in a way that would make it hard to bring it to Android. Android development is already more problematic than building iOS apps for a number of reasons, including the wide variety of devices that it runs on, the fact that many of those devices aren’t able to be upgraded to the latest versions of Android, and that we weren’t able to reuse any of the code that we’d built for our Mac OS X, Windows, or iOS apps. For a small team like ours, we have to concentrate our resources on building features that benefit the majority of our customers, and that meant prioritising iOS ahead of Android because Android development was so much more difficult for us. Our new iOS app has been developed entirely in-house, and rewritten from the ground up. This has allowed us to rebuild it in a way that should make it more feasible for us to build an Android app that shares many of the same features. Once we’ve finished launching our new iOS app and the forthcoming Light Blue 7 desktop app, we’re hoping to be able to start working on bringing our mobile app to Android. As always, we can’t make any promises about future features, including release dates. Building our new iOS app was a huge project, and bringing it to Android is going to be an even bigger challenge. There’s a lot that can go wrong with a project like this, and we’re going to be dependent on a lot of factors that are outside our control. However, we want to remind our Android-using customers that they’re important to us, and that we’re keen to make sure that you’ll be able to access Light Blue via your mobile devices. We’re working hard towards that goal, and our new iOS app is a big step towards that. Throughout this short series of articles, we’ve been covering how to make the most out of the information that you’ve already entered into Light Blue. There’s a few different ways of finding useful information that’s already in Light Blue, both with Quick Queries and creating your own more specific searches using the Query Dialog. Once you’ve found the data you’re looking for, you can step back and look at the bigger picture using List View. But there’s even more that you can do to make the most out of the valuable data in Light Blue, and in this article we’ll have a look at exporting information from Light Blue for use with third-party tools. Before you export anything from Light Blue, you’ll need to find the records that you’re interested in. These could be within one of the Quick Queries (the saved searches in each of the main sections in Light Blue), a more detailed search that you’ve performed using the Query Dialog, or the result of one of the Custom Reports you’ve saved. Clicking the Print/Send in the toolbar while you’re using List View allows you to produce a simple PDF of the results of your search. It’s read-only, but that’s still useful for getting a snapshot of your data. There may be occasions when you want to export a specific set of fields from your search, perhaps to import into a spreadsheet in Excel. Clicking File > Export… opens a dialog similar to the Customise List View dialog we looked at in the last article. 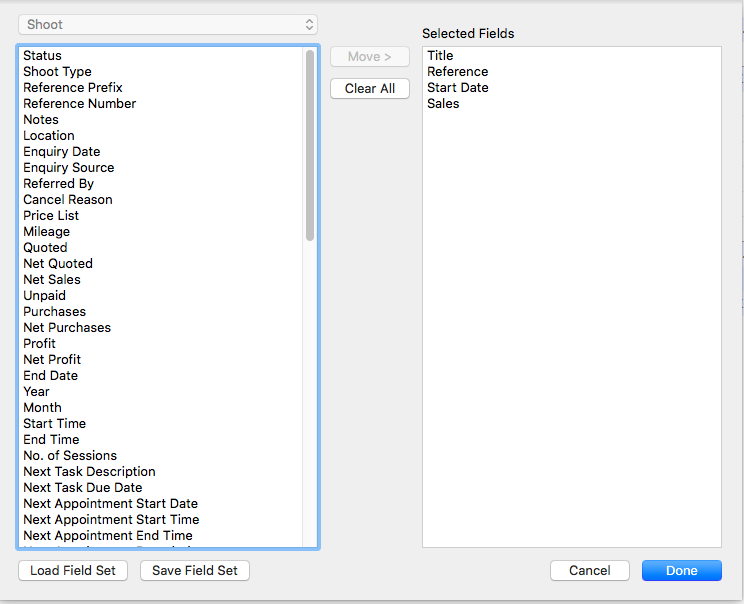 Here you can specify which fields of data you’d like to export (and in which order). That will produce a CSV file (a simple spreadsheet) of the selected information from the records in your list. You may be exporting the same information on a regular basis, and want to keep the format consistent. Saving a field set means that you can load the selected fields (and their order) again in the future, so you don’t have to remember which fields you were exporting. If you want to send out a large email newsletter to a list of your contacts, using a service like Mail Chimp for example, you can export a list of email addresses at the click of a button. This produces a CSV file which you can upload/import into whichever application you’re using. Finally, when preparing information for your accountant, there’s a really handy ‘Export Financial Information’ command. Once you’ve specified the period you’d like to cover (last financial year, for example), Light Blue will save a number of CSVs which you can send over to your accountant, without having to spend ages setting anything up! Because all of your information is in one place, making use of it is really simple. There’s no need to spend ages collating the data, to be copying and pasting things, or doing anything complicated, and because reports & queries pull up your live data, you’re always seeing the most up to date information. You can use everything you’ve entered into Light Blue to give you an overview of how your business is performing and where you need to focus your efforts so that you can hit your goals! In this short series of articles, we’ve been covering how to make the most out of the information that you’ve already entered into Light Blue. We’ve previously looked at different ways of finding useful information that’s already in Light Blue, both with Quick Queries and creating your own more specific searches using the Query Dialog. That data is really useful and can tell you a lot about how your business is doing. In this article we’ll explore how we can step back and look at the bigger picture using List View. When you view the results of a query, you can see all the records that fall into that found set in either Detail View (the default), or List View. List View is a really good way of seeing a big group of records all at once, and the totals and averages that it provides are great for quickly understanding your data. When you go into List View, Light Blue will show you a default set of columns, but you can choose to customise this to display the fields that are relevant to you. For example, you may be interested to see how profitable all your shoots from the previous month were. Having queried for those records, you can now customise the list view (by clicking Window > Customise List View) to show columns of the most relevant information. In List View, you can view the found records as one big list, or you can group them to give you a more helpful view of your data. For example, it’s really useful to get an idea of how your bookings are doing year on year, so running a query for all of your confirmed or completed shoots in last year, this year and next year is a good starting point. While you can sort all of these records by their start date, it can be pretty hard to see where one year ends and another begins, and without totals you’d need to count them up in your head. Grouping the list view by year means that there’s a clear separation between shoots from one year and another. You’ll notice that we’ve now got sub-totals and averages for each group, essentially a list within a list. At a glance we can now easily compare how one year has performed against another. Grouping records together isn’t limited to just one criteria, either. If you wanted to group your shoots first by year and then by enquiry source, that gives a useful picture of how many shoots you’ve booked for each year and also which types of marketing are proving most effective. There’ll be some cases where you want to run a one-off analysis like this, but plenty of other cases where you might want to keep an eye on a particular set of figures regularly. 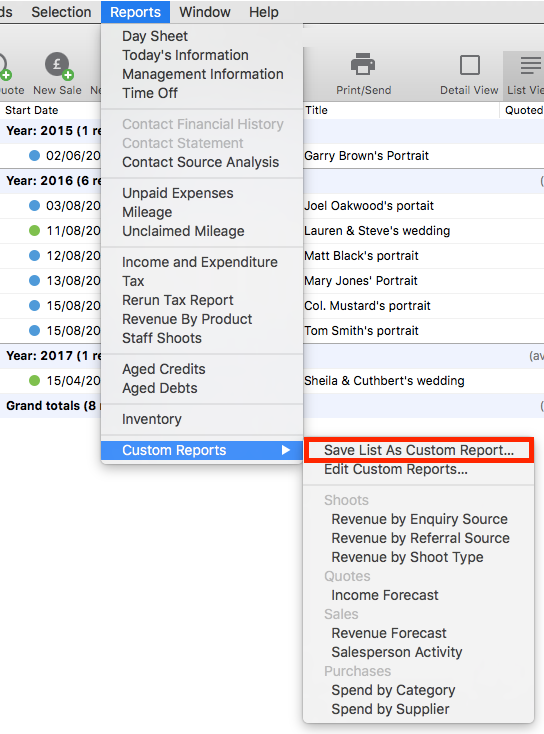 Light Blue allows you to save a query and the customised list view as a custom report, so it’s ready with a couple of clicks. It’s a huge time-saver for anyone who’s interested in getting the most out of their data. Whenever you want to re-run your report, you’ll find it in the Custom Reports submenu of the Reports menu. There’s even more that you can do to make the most out of the valuable data in Light Blue, and in the next article we’ll have a look at exporting information from Light Blue for use with third-party tools. This is the second instalment of a short series of articles that will be covering how to make the most out of the information that you’ve already entered into Light Blue. That data can tell you a lot about how your business is doing, and help you to take a step back and look at the bigger picture. The great thing about using Light Blue is that all of the information that you need for this is in one place. In the first article, we talked about Quick Queries, which are saved searches of your current data. These queries are automatically updated and show all of the relevant records that match each saved search. Compared to using Quick Queries, Light Blue’s Query dialog allows you to be much more specific about the information that you’re searching for, and construct your own queries. These queries can be as simple or detailed as you like, and all of our Quick Queries were built in the Query dialog and can be loaded into it. For example, you may be interested in targeting some of your clients for a particular promotion. For example, all of your portrait clients who’ve spent more than £500. 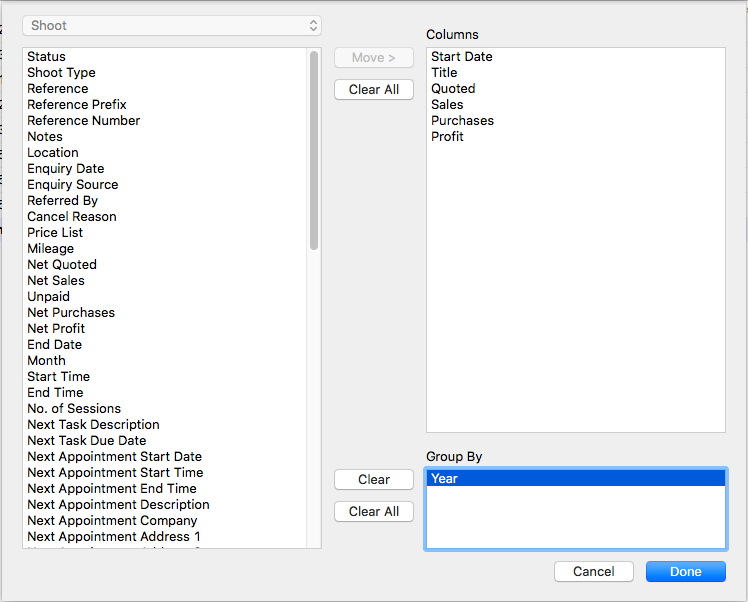 You can narrow down the selection of records that the Query dialog returns by adding extra criteria, as you can see in this screenshot. In most cases, when you’re building a query and want to add extra criteria, you’re adding them to narrow down the selection of records that Light Blue will find for you. In our first example, we started off with all of our portrait shoots, and then narrowed that down by specifying that we were only interested in those portraits shoots that also spent more than £500. This is an example of what’s know as an “and” search, where you’re looking for records that match all of your criteria. You also have the option of adding more advanced options to your queries, including “or” operators and grouping parts of your query together using brackets. 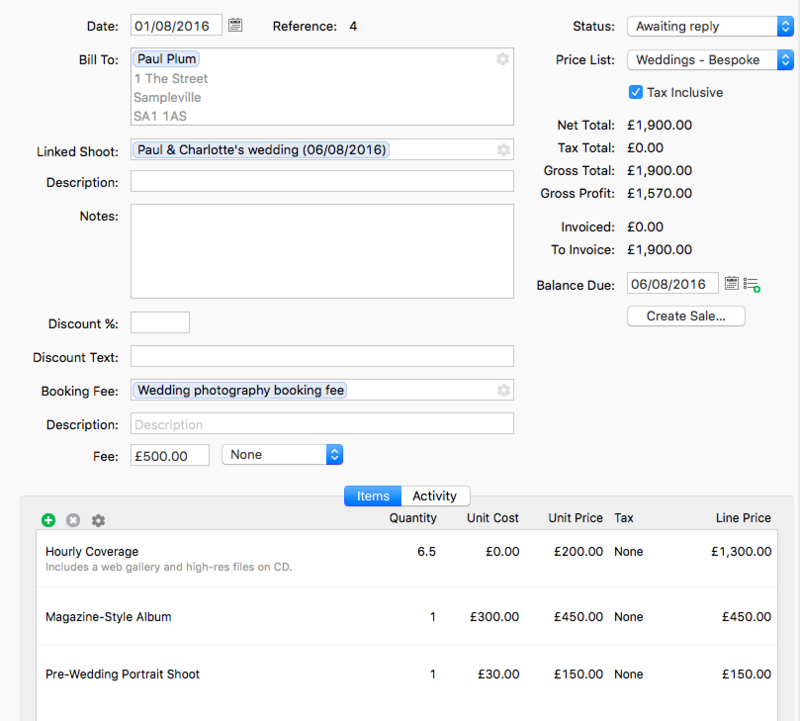 We’ll go into more detail on these advanced features in a future article, but for now here’s an example of how you could modify our example query to search for portrait shoots that spent more than £500 or wedding shoots that spent more than £1,000. You may find that our existing Quick Queries are helpful, but that you’d like to refine the search a little more. With the Query dialog, you can load an existing Quick Query to use as a starting point, and then add more criteria to your search. 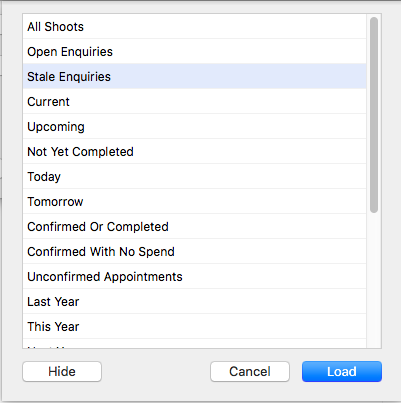 The “Stale Enquiries” query is shows you all of the unconfirmed shoots that first got in touch more than a month ago, but don’t have any more outstanding tasks. However, let’s say that you’re only interested in a specific type of shoot you could add that criteria to the query. Saving queries saves you time! Everyone runs their photography business in their own particular way, and that means that the information that’s important to you is likely to be different to whatever’s important to the next photographer. Light Blue allows you to add your own queries to your list of Quick Queries, and therefore makes it easy to keep an eye on whatever’s important to you. 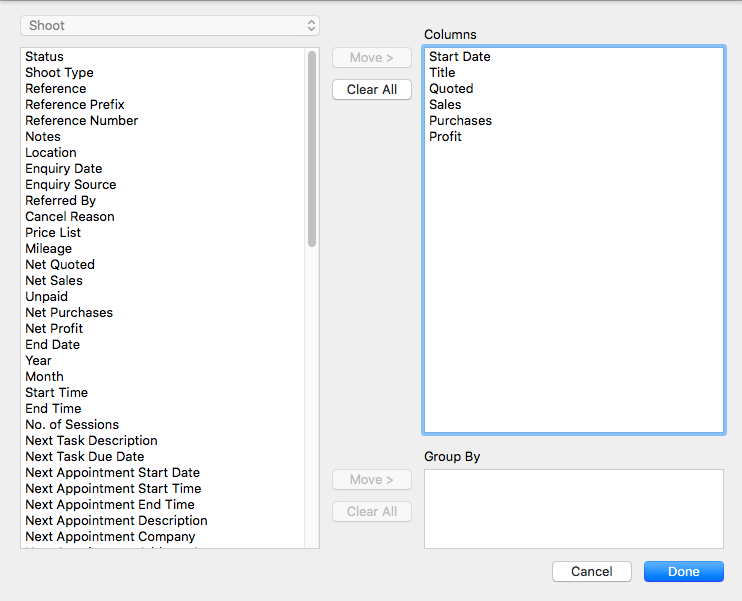 To do that, first build your query in the Query dialog. When you’re happy with it, click the “Save Query” button and give your query a name. So far, we’ve talked about using Quick Queries and the Query dialog to find a selection of records. In the next article in the series, we’ll look at how you can use the List View & Custom Reports to analyse data in more detail. One of the great advantages of using Light Blue is that all of the information that you need is in one place. That data can tell you a lot about how your business is doing, and help you to take a step back and look at the bigger picture. That’s where Light Blue’s reporting features are invaluable, allowing you to use everything you’ve entered into it to give you an overview of how your business is performing and where you need to focus your efforts so that you can hit your goals. You don’t need to spend ages collating the data, there’s no need to be copying and pasting things, formatting spreadsheets or setting up complicated pivot tables in Excel! This is the first in a short series of articles that will be covering how to make the most out of the information that you’ve already entered into Light Blue. We’ll be looking at how to create your own reports, with some specific useful examples, and also discussing when exporting information out of Light Blue may come in handy. Before that, I’d like to tell you more about Quick Queries which are saved searches of your current data. The queries are automatically updated and show all of the relevant records that match each saved search. In each of the main sections in Light Blue, you’ll notice a column on the left hand side which displays a set of Quick Queries. You’ll see a different set of Quick Queries, depending on whether you’re looking at the Shoot screen, Contacts screen, Sales screen or Purchases screen, for example. Keeping an eye on your outgoings is important for any business, and there’s a load of Quick Queries in the Purchases screen to help you. You can see all of the purchases that have been made within a variety of periods – all of last months purchases or all of the purchases you’ve made this financial year, for example. In the Sales screen, you can see a list of all of your invoices that have been sent to customers and should have been paid by now, but are currently marked as unpaid. This is really helpful for seeing all of your overdue invoices in one place and allows you to quickly chase them all up at once. You could send an email to all of those billing contacts, so you’re not spending ages sending them all messages. In the Contacts screen, there’s a few Quick Queries that help you to see when you’ve got upcoming birthdays within your customer base. That’s great for sending a simple “happy birthday” message, or planning ahead and suggesting that they book a portrait session. One of the really great things about Light Blue is how flexible and customisable it is, and that’s what I’d like to focus on in this series. It’s possible to create and save your own Quick Queries, which we’ll be talking about in our next post. 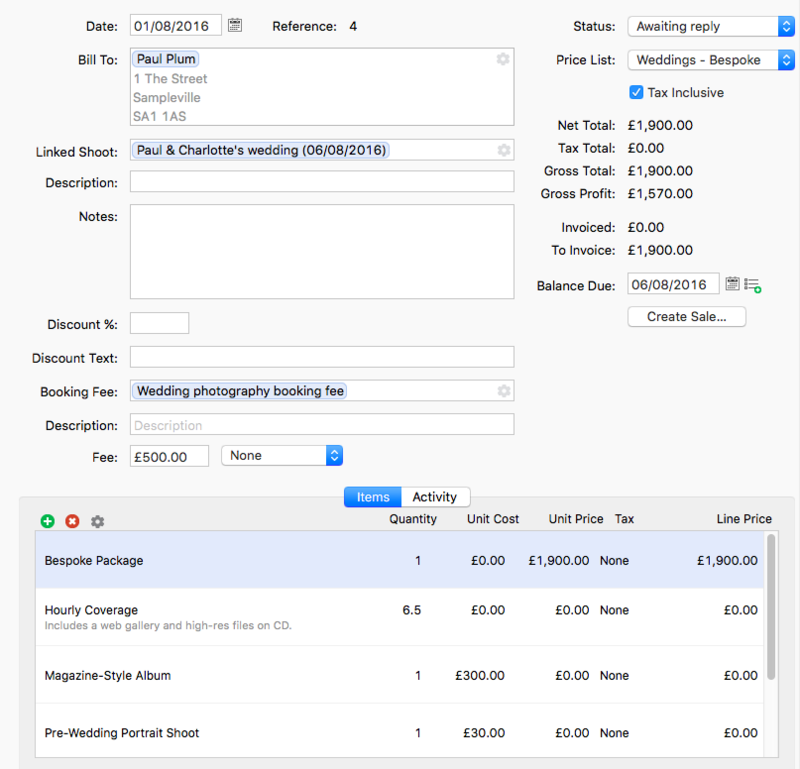 Price lists are one of the many time-saving features built into Light Blue, allowing you to create a list of predefined products & services that can be used to quickly and accurately enter a quote or sale. They save lots of repetitive typing, or copying and pasting from old invoices. You can find out how to set up a price lists in our video tutorials section. Light Blue is full of features that allow you to set up templates to save time, but those templates are always designed to give you the flexibility you need to treat your clients as individuals. Price lists are no different. Sometimes, you may have a client who requests a small change to an existing product or service that you offer. Perhaps you’re a wedding photographer, and they’re not interested in the parent albums that are included in the package that they’ve chosen? The simplest approach is for you to use your price list, but then adjust the description and value of a product once it’s been added to a quote or sale. Another handy feature of price lists is being able to include an estimated cost for each item. These costs are used when creating quotes, and allow you to keep a close eye on your estimated profit for the job when setting up a bespoke quote. Many photographers sell packages of products and services, and there are a variety of ways of structuring these in your quotes and sales in Light Blue. Again, price lists can help you to set up them up quickly and flexibly. The simplest and most popular approach is to create a single item in your price list for the package, give it a sensible name, and list the contents of the package in the description field. However, some photographers prefer to break the package down into separate items. One drawback of this more granular approach is that this could encourage your client to chop and change things a little more than you’d like, or invite them to scale down their package by more than you are comfortable. To avoid that, you could create a dedicated “Bespoke package” price list where the unit price of each item is £0, but you’ve still entered the unit costs as accurately as you can. Then, have another item just called “Bespoke Package”, to which you manually add whatever unit price you intend to charge. That way you’ve got a good idea of your material costs before you decide what you plan to charge for the package.